At 6'2" and only 148 pounds I have an exceptional need to conserve body heat - I have too much skin surface and not enough heat-retaining volume, so I quickly lose heat from my core compared to the cold-adapted barrel-chested Inuit people of the far north, for example. And Because I'm starting my hike in the dead of winter (Just two weeks to go now!! ), hypothermia is something I take seriously. One of my primary jobs, as I traverse the Appalachian Trail, will be to keep constantly aware of my core body heat. Taking my cues from the Inuit, I'm planning to carry around an 'artificial barrel chest' in the form of seven mix and match layers of shirts, jackets and coats. With them all on, I look as puffed-up as a marshmallow. There are two shirts, two fleeces, two down-filled layers, and the item shown at left, which is my workhorse layer - a Gore-Tex wind/rain shell from Mountain Hardwear. This shell is actually more important to me as a wind-block than as a rain jacket (in any substantial rain, you'll get wet right through it, and/or around it, and/or by accumulating sweat from the inside out). It has proven its worth on Mount Washington, NH in March, at 20,000 feet in Bolivia, Chile and Argentina, and here on the beach in the frigid December winds. The beach? Yes, this week I'm back here on Topsail Island, NC, experimenting with clothing while beach walking to try to maintain hiking shape. The weather has ranged from almost summer-like with calm winds to this morning's upper 30's with steady north breezes. I've posted before about the inadequacies of hiking the beach as preparation for the Appalachian Trail. Yes, the beach is a good place for testing gear in windy conditions because the beach is so exposed. But the big problem is that there are no hills. You can hike the beach without ever raising your heart rate. You don't even exercise some of the key muscles used in ascending and descending. And now I'm learning that beach hiking doesn't help you practice active (adaptive) temperature management either. On the AT, you're constantly switching from hard uphill slogs where you're generating lots of body heat, to level and downhill sections where you're 'coasting' and losing body heat. During long uphills, I shed layers, only to put them on again during the downhills that inevitably follow. As I said, this constant adjustment is critical to me because of my slender build, and also because I just hate to get cold--I seem to be unusually sensitive to cold and like to keep my body heat 'reservoir' as near to full as I can without sweating. During winter conditions, these adjustments are more extreme and require more attention. You have to avoid sweating on the uphills so as to avoid the evaporation over-chilling on the downhills. This is a lot of work - mental as much as physical - I find I need to remain constantly alert to my body's signals so as to avoid both extremes. And like everything else in life, practice helps. The more I work with my mix-match array of seven torso layers, the easier it is to keep temperature equilibrium. The more I experience different weather conditions, the easier it is to know what layers I prefer to use, what layers give me the most protection for the weight, what layers work best when wet, etc., etc. wear torso layers with hoods. They seamlessly keep my neck out of the wind. Three of the seven torso layers I carry have hoods: a hooded sweatshirt, the hooded shell shown above, and my Sub-Zero mountaineering down coat with detachable hood. shorts are usually enough. I can go bare-legged even with the temperature well below freezing as long as there isn't much wind. My feet don't get cold easily, and I find that my legs are almost impervious to the elements. (My hands are an entirely different story - see next item). So far, when the weather turns extreme, I've only needed one layer of long pants--my insulated Mountain Hardwear Compressor pants, shown at left. 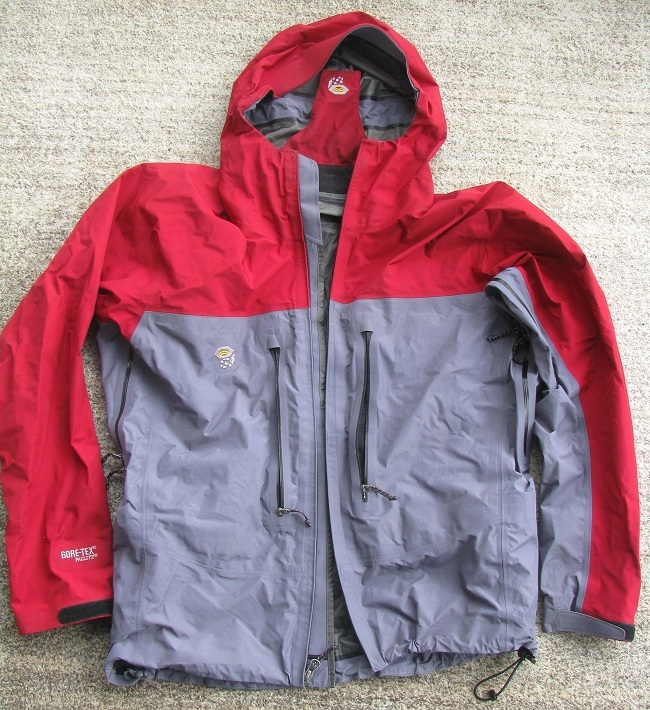 This is another one of my work-horse gear choices, used successfully at high altitude in cold weather, but not yet tested for wet conditions. 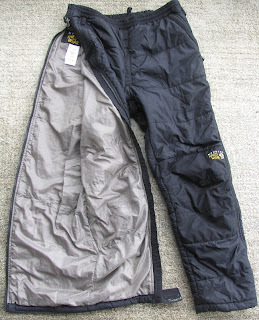 I also have a pair of rain pants I've never used and a set of wool thermal leggings that I used successfully back in my bicycling days. Keep hands warm. My hands turn out to be my most reliable 'canary in the coal mine'. The tips of my thumbs get numb quickly, followed by my fingers, whenever my body heat reservoir begins to empty. My torso may still *feel* comfortable, but I know I'm more chilled than I should be when my fingers get cold. Soccer players and marathon runners in cold weather often wear gloves accompanied by nothing more than thin t-shirts and shorts. That's how I know I'm not crazy. I actually prefer a thin pair of mittens rather than gloves, so my fingers can keep each other warm. I'll often keep these mittens on even with temperatures in the 40's. Use head wear to fine-tune the rate of loss of body heat. How often have you heard the urban myth that half the body's heat is lost through an uncovered head? The actual percentage seems to be more like 20 to 30 percent. But whatever the exact percentage, the concept works, at least for me. When it gets below 50 degrees I wear a knit hat that I can pull down over my ears completely. When it's really cold, I pull a hood over that, eventually two or three hoods. When I begin to feel too warm, I remove the hood(s), then begin to roll up the knit hat exposing my ears. If I'm still too warm, I loosen the collar of the wind shell and lower the zipper to expose my neck. Short of actually shedding layers, these steps usually suffice for temperature control. slow down on the hardest uphill pitches. Hiking the AT is not a race. It's easy to work up a sweat through a very short section of steep climbing. For me it can take as little as thirty seconds. And once you've got your inner layers wet, they're going to chill you--even the supposedly 'wicking' layers don't avoid this. (a 'wick' doesn't do any 'wicking' unless it's *wet*). It's so tempting to just power through such short sections of steep trail, but in cold weather, that's generally a bad idea. You'll either have to endure the evaporation cooling of your sweat, or have to stop and dig into your pack to adjust your layers--which, of course, totally negates the few seconds you 'saved' by powering through the steep grade. In this case the old 'tortoise and the hare' analogy truly applies. I expect that as much as I've prepared, there will still be a steep learning curve as I hit the AT in two weeks. For one thing I haven't done enough wet weather hiking. The few experiences I've had hiking for hours in steady cold rain with temperatures near freezing were memorable for how cold I got, so I'm planning to err on the side of over-dressing and hope that I learn which of my layers work effectively when they are soaking wet.